A white paper providing a layman's guide to Hazardous Area Certification. What follows is a consolidation of much of the detail, some of it unsurprisingly technical, that we routinely explain to those asking about aspects of hazardous area protection that relate to their intended purchase, or development of a product or solution. This page is intended as general information only, and not in any way specific to particular situations or circumstances. You should always consult with and follow the regulations of your workplace under the guidance of a suitably qualified and endorsed hazardous area assessor or compliance officer before using any electrical equipment in a potentially hazardous area. Secondly, this is not meant to be an engineering discussion paper. If you are looking for those, there are lots of other resources of that type around. Instead, this is as close to a layman's outline of the relevant information as is possible given the nature of the topic. Should you find any errors or omissions with this document, please notify us, and we will do our best to include your suggestions where relevant. Device Markings Just what do all those letters and numbers really mean? While each country has its own standards of conformance, the major standards and classification systems can loosely be combined as those relating to conformance standards based out of Europe, the US & Canada and the IECEx conformance initiative, which is the first attempt at reaching a globally harmonized standard. The IECEx Scheme is an international Conformity Assessment Scheme covering Electrical Equipment for Explosive Atmospheres, as the internationally accepted means of demonstrating conformity with IEC Standards prepared by IEC TC31. IECEx is about giving confidence that a product or service meets clearly defined transparent criteria. It's aim is to harmonise standards to allow free movement of goods by establishing a world-wide accepted standard. This will result in a single set of standards, a single certificate and a single mark. The benefits of the scheme are obvious – shorter certification lead-times, and the opening up of new markets with no (or very little) need for additional testing and assessment to satisfy national standards. It is limited specifically to electrical equipment only. As opposed to ATEX, IECEx has been made from the outset as a Type 5 Certification Scheme, relying on a single third party to bring together all aspects of design and production control before issuing a publicly available Hazardous Area Certification. Thus the public domain documentation is a certificate issued by the certification body. Furthermore, because of the online IECEx database, any purchaser of the equipment can check the current status of the certificate on the web. For Australia: Australian standard AS/NZS 60079 is harmonized with IEC 60079, so that the national certificate of conformity (ANZEx) is accordingly fully harmonized with the international certificate of conformity (IECEx). Equipment certified to IECEx can therefore be used almost without exception in Australia without the need for further testing or hazardous area approvals. Note: IECEx does not cover the requirements for general electrical compliance in Australia (RCM Mark). Unfortunately, while many countries 'accept' IECEx, they have not harmonised their own national standards in line with IECEx in the same way, meaning the actual worldwide acceptance of IECEx is not as close as it may seem to be. As most of the world's certified equipment is manufactured in Europe and the USA, the national standards of these countries are a manufacturers first choice for certification, although dual certifying devices to ATEX and IECEx, especially for Zone 1 approvals, is the norm in most instances. For Australia: Australia does not natively recognise ATEX for a number of reasons. Chief among these is the concern that the Document of Conformity (DoC) or certificate of Conformity (CoC), which is the only public domain document that is required can be issued by the manufacturer, who is responsible for it. This effectively allows manufacturers to 'self-certify' or declare the equipment to be safe. By definition, certification is the action of a third party (see ISO/IEC Guide 2) and clearly this leaves the system open to abuse where the DoC is the action of the first party and therefore falls outside the definition of certification. ATEX equipment can be used in Australia with evidence that the device has been tested by a recognised third party or 'Notified Body' and where the manufacturer holds a QA manufacturing certificate to ISO standards. This qualification is performed by an Australian assessor on behalf of the company intending to use the device and a Conformity Assessment Document (CAD) is issued certifying that the device has met the basic requirements for an IECEx or AUSEx certificate. The Canadian Electrical Code and U.S. National Electrical Code IEC 60079-10 mandate the standards for hazardous area devices in North America. These standards are slowly changing to fall into line with IECEx. Until recently it was impossible to accurately draw parallels between the North American system of Classes and Divisions and those of ATEX and IECEx, however Canada has now fully adopted the 3 Zone system for new equipment and US products can continue to be labelled either way. For Australia: Australia does not recognise the system of Classes and Divisions and any usage of equipment certified to North American standards must have a CAD (see above) completed for each device type and use case. This is an area of major confusion for many of our customers, caused mostly by the use of incorrect terms or limited knowledge of the ways in which a device can be made 'safe'. The term 'intrinsically safe' is often used when requesting equipment, however this is actually only one of several methods which can be employed to ensure that an electrical piece of equipment can be operated or used in a potentially hazardous environment. The method selected by a manufacturer to make a piece of equipment safe is typically driven by the way it is to be used, and the relative pros and cons of the functionality of the device. Some of these are obvious when you think about it. For example, it would be impossible to render a mobile device safe using the protection concept of oil-immersion (o). Similarly, a large electrical motor can hardly be rendered safe using intrinsic safety, which demands that operating currents and voltages must be extremely low. Others are less obvious; you could, for example, fill a standard computer or phone full of quartz sand (q) and make it safe, but what would the effect of that powder have on the weight, or the wear and tear on sensitive electronic components inside the device, not to mention the issues presented when it needs repair? The table below shows the various types of protection and the concepts or methods used in each case. The symbol for each type must be shown as part of the device markings. So now we understand the various ways to make a device safe, what are these Zones all about? Zones are a method of identifying the potential risk based solely on the presence of the flammable substance (gas / dust) under normal conditions. The higher the likelihood of the device being used when a flammable substance is present, the higher the risk, and conversely the lower the zone rating. Equipment intended for use in a particular Zone must meet the standards of testing for that Zone. So while a Zone 1 certified device can be used safely in either Zone 1 or 2, it cannot be taken into a Zone 0 area. Consequently, Zone 2 certified devices must be introduced with caution into well defined / separated areas if the facility also includes Zone 1 or Zone 0 areas. See the following chart which shows the zones under both IECEx / ATEX and the North American system of Classes & Divisions. Areas where potentially explosive liquids, gases or dust are being produced, refined or where some repeated contact is likely are generally classified as Zone 1. Conversely, examples of Zone 2 areas are storage areas, maintenance workshops and other ancilliary areas adjacent to the main production areas. Potentially flammable gases or dusts can spontaneously ignite under several conditions, and temperature is a major factor. 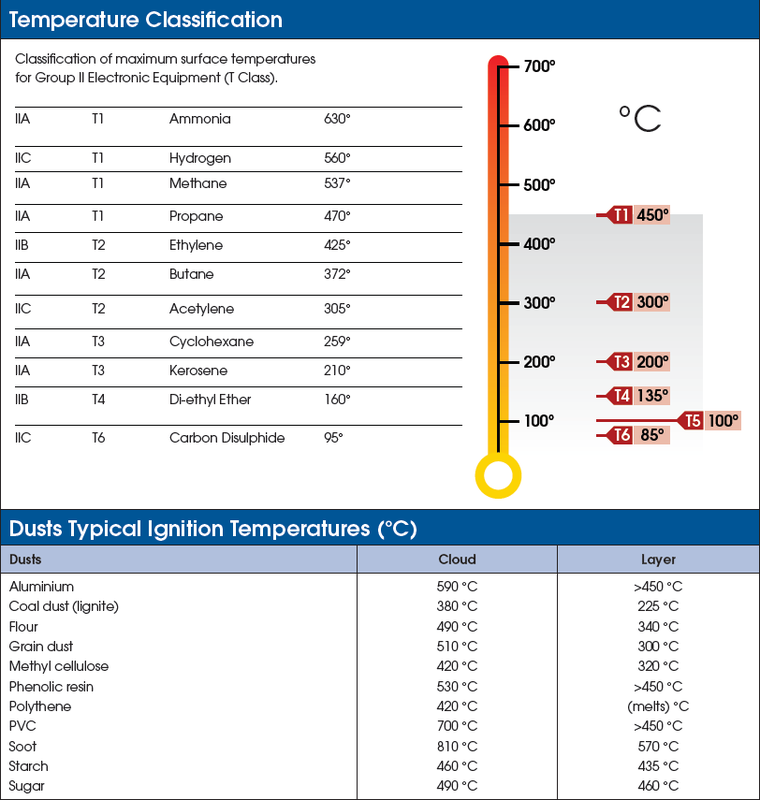 Consequently, devices used in potentially hazardous areas are tested under fault conditions and classified into temperature (‘T’) classes depending on their ability to maintain a maximum permitted surface temperature, which is identified as part of the required certification markings. The better the equipment, the lower the rated surface temperature. In other words, a rating of T4 is better than T2. Therefore those items certified as being T6 can be used in T1, T2, T3, T4, T5 and T6 gases. Whereas a T2 certification only allows a piece of equipment to be used in T1 and T2 gases. 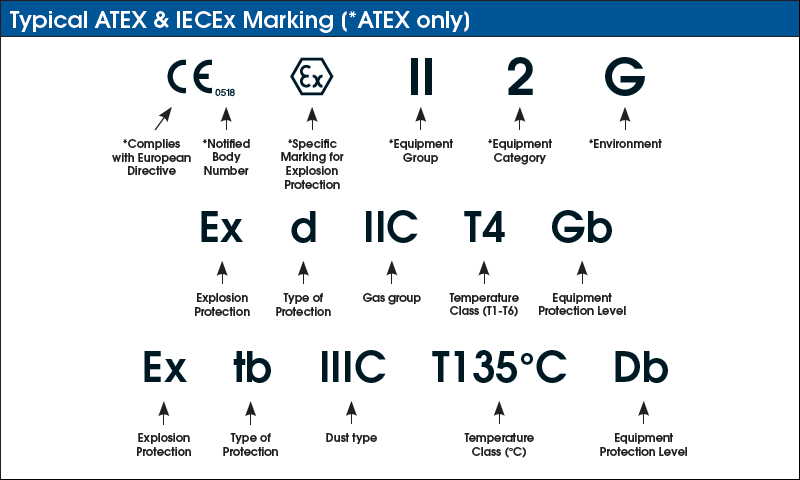 A table is included below which breaks down the IECEx and ATEX codes to help you try and make sense of them. 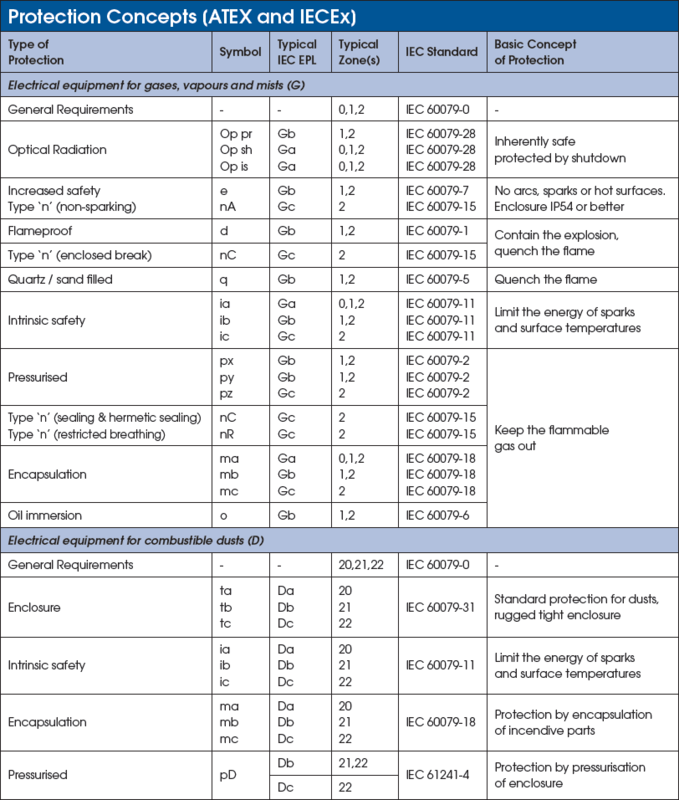 Note that when viewing ATEX device markings, in the wisdom designed to dumb-found mere mortals, the Equipment or 'Device Category' is expressed as a numeric value 1, 2 or 3. This should not be confused with the Zone it is intended to be used in, as Zone 0 = Category 1, Zone 1 = Category 2, etc. If I put a device in a water proof case, the gas / dust can't get in and it's safe... right? Answer: No. Waterproof cases aren't designed to suppress the heat and flame from a defect in your device. Google 'Samsung Note 7' & you'll quickly realise the issue here. In addition, most waterproof cases are designed to allow you to submerse your device in water. Given that your device needs a flow of air around it to keep it cool, putting it in an airtight case without any water around the case to cool it is probably going to increase your chances of it overheating. Answer: Possibly. If the manufacturer holds a conformity certificate to IECEx, then the item will generally meet the standards for use in most hazardous area gas and dust applications in Australia. If the device is has no conformity certificate listed on the IECEx website, you will need to request a qualified hazardous area inspector or assessor to perform a conformity assessment to determine whether the standards and methods used in the original certification are deemed to conform with those demanded for use in Australia. If successful, they may be able to grant a Conformity Assessment Document (CAD) permitting you to use the device within specific parameters. Answer: No. Equipment manufacturers or agents do not have the requisite site experience and cannot determine the risk attributed to a site or plant area. You should always consult a qualified hazardous area assessor, with experience of the particular risk profile of the site, to determine the correct Zone rating for installed and mobile equipment to be used in a particular area. Keep in mind that unless there are specific logistical barriers in place between differently zoned areas, mobile devices are inherantly 'mobile', as they are carried by personnel. As a Zone 2 area instantly becomes a Zone 1 (or Zone 0) area when flammable gas or dust is actually present, and mobile devices are often called upon in times of emergency, using a mobile device with the highest safety protections is something we highly encourage. We hope this Tek Tip has been helpful to your understanding of Hazardous Area Certification. If you're interested in how this relates to mobile devices specifically, check out out Tek-Tip on Mobile Devices in Hazardous Areas. Otherwise, if you'd like further assistance, please don't hesitate to contact us.